One can tell that an elephant is huge not just by looking at its body parts. There are many other indicators – from the size of its footprints, to the amount of food it eats, to the amount of underbrush it crushes. Similarly with the Chinese transplant industry, its mammoth size, far larger than the official figure of 10,000 a year, can be detected not just by looking cumulatively at the many individual hospitals engaged in transplants, but also by looking at a wide variety of other indicators of volume. This chapter does that. 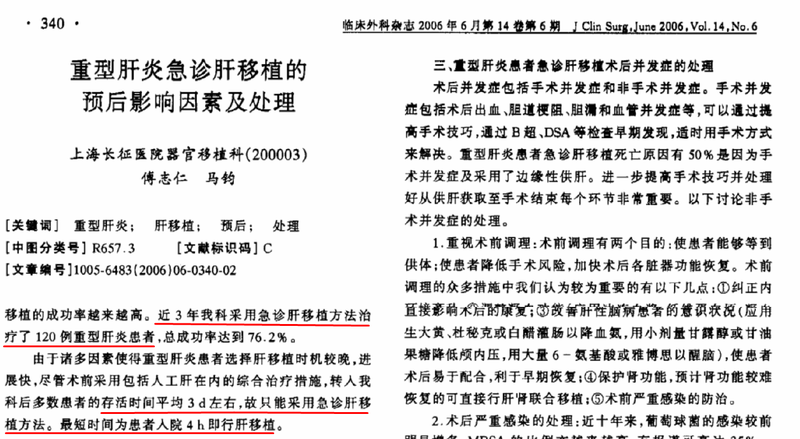 China officially acknowledged 118 liver transplants in 1999. According to He Xiaoshun, the number in 2000 was 10 times higher; by 2005, the annual number had tripled to 5,192. However, this was just the beginning of the rapid growth, when liver and kidney transplants became a routine operation throughout the country. On May 11, 2011, Wu Mengchao, president of the Affiliated Eastern Hepatobiliary Surgery Hospital of the Second Military Medical University and “father of hepatobiliary surgery in China,”1382 claimed in an interview with Sina that, “in terms of liver transplants, our quantity has been the largest in the world. The quality and result are also good. We have caught up with international standards.” 1383 About 6,000 liver transplants are performed in the U.S. each year.1384 As set out elsewhere in this report, Tianjin’s Oriental Organ Transplant Center’s annual volume alone surpassed the annual number of liver transplants in the U.S. In the previous chapters we cited a number of Chinese media reports as sources of evidence about transplant volumes in individual hospitals. These media reports are significant beyond the information contained in them. Outside China, in countries with a free media, information in the media is not much different from information found elsewhere. What is relevant is the information which is contained in the media. In China, it is not like that, because everything in the media escapes either censorship or self censorship. A media story in China is not just the information contained in it. It is also a statement that the Party wants this published, or has allowed it to be published or that the author and medium both think that the Party would not mind its being published. What is true of the media is also, in one sense, true of hospital websites and research publications. Nothing gets posted or published without the approval or implied consent of the Party. Nonetheless, the media are subject to especial Party scrutiny. The Government of China General Administration of Press and Publication (GAPP) focusses specifically on the print news media and books. The State Administration of Radio, Film and Television (SARFT) focuses on radio, TV, film and internet broadcasts. When something comes out in the media, the fact that it has survived this scrutiny means something. The media stories about organ transplant volumes are a bit like the phone call admissions. The medium which reports the story, like the person being called, is oblivious to what in fact is being admitted. The media stories are snippets of information about high transplant volumes. They are, in effect, mindless admissions or concessions by the Party/State that the volume of transplants is a lot higher than the official Party line of 10,000 a year. We reproduce below some of these media stories. 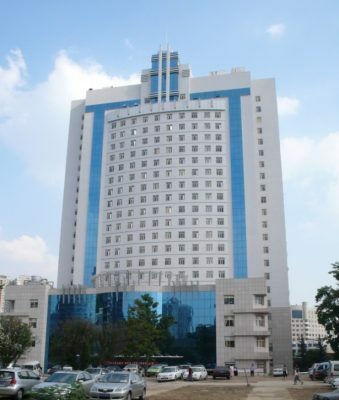 According to a report by China Times on May 1, 2006, two large Taiwan companies invested in the construction of Xiamen Changgeng Hospital, which was scheduled to become operational by the end of that year (2006). This hospital would focus on organ transplants. A Taiwanese businessman told the media that a Class 3 hospital in Zhangzhou, a city neighboring Xiamen, in Fujian Province, conducted at least 3,000 kidney transplants annually. 1390 At least a quarter of the kidney recipients were from Taiwan. Calculating by the market price of $1 to 2 million NTD (New Taiwan Dollar) per kidney transplant, Changgeng Hospital would have a promising future by focusing on organ transplants. 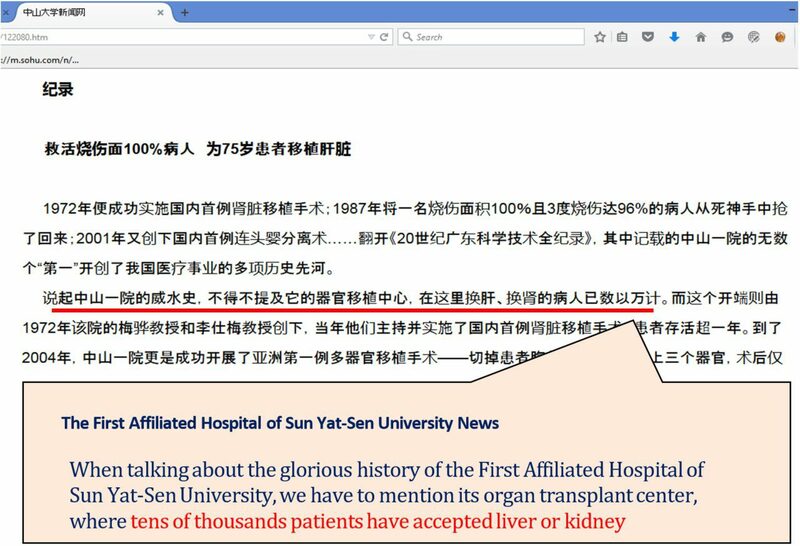 On celebrating the 100 Anniversaries of the First Affiliated Hospital of Sun Yat-Sen University, a report was posted on the news website of Xinkuai Paper . 1391 It revealed that tens of thousands of patients had accepted liver or kidney transplants at its organ transplant center. Over the past decade, the Chinese authorities have not released the annual volume of each hospital and only claimed that 10,000 to 20,000 organ transplants are performed each year. In addition, it has actively removed data previously published on individual hospital websites. However, even from the data scattered on the websites, it is obvious that this number would be easily surpassed by just a few hospitals and individuals. One should keep in mind that many of these published figures are likely deflated, as hospitals attempt to cover up the true volume of transplants being performed (see section IV: Cover-Up). The institution had close to 30 specialists before 2001. Eleven chief surgeons and six associate chief surgeons carried out kidney transplants.1398 If the three doctors Li mentioned had been performing hundreds of kidney transplants a year, then the seventeen chief and associate chief surgeons would collectively have conducted well over thousands each year. In that case, how many transplants has the hospital performed in the past 15+ years? Li Leishi was not the oldest of China’s active transplant doctors. Academician Wu Mengchao, China’s Father of Hepatobiliary Surgery and president of the Eastern Hepatobiliary Hospital affiliated with the Second Military Medical University, averaged 200 surgeries per year even at age 89. As of 2010, Wu had presided over 14,000 liver surgeries, including 9,300 hepatectomies,1399 the remaining 4,000+ surgeries remain unidentified and are likely to be liver transplants. This transplant center has 231 medical and research personnel. It had 316 beds in 2010 and 393 beds in 2012, 1404 though its website now says 330 beds. Its bed utilization reportedly leads that of similar military organizations. Even without taking into account deflation of published transplant volumes, its total number of transplants performed is staggering. Professor Wang Hongwei, director of the kidney transplant department at the Second Hospital of Shandong University, has participated in nearly 2,000 kidney transplants over the course of 20 years. He led his team once completed 10 kidney transplants in one day.1415 Deputy director Tian Chuan participated in nearly 1,000 kidney transplants. We have seen many instances in which multiple donor organs were procured for the same patient, either due to organ rejection or as spares. These cases include even third and fourth transplants and eight spare organs procured for the same patient. In 2006, a chief surgeon named Wang Guangce published a study analyzing 50 kidney re-transplant cases at the First Affiliated Hospital of Henan University of Traditional Chinese Medicine. 1420 Among the 50 cases, 46 were second transplants, 3 were third transplants, and one was a fourth transplant for the same patient. Five of the cases were orthotopic re-transplants within 10 days of the original transplant, and the duration between transplants and re-transplants ranged between 2 hours and 8 years. This indicates that, in 5 such cases, a second kidney was found and transplanted within 10 days. In at least one case, another kidney was found within 2 hours. Some transplants took the lives of 3-4 people. In mainland China, it is not unusual to perform several transplant attempts for the same patient if the initial attempt is not successful. Every year, there are numerous cases where two, three, or even four transplant operations are performed for the same patient. For example, Shen Zhongyang at the Tianjin Orient Transplant Center performed two separate liver transplants for the ­­movie star Fu Biao. Surgeon Zhu Tongyu at Zhongshan Hospital Affiliated to Fudan University performed kidney transplantation for the fourth time for the same patient. According to the Chinese Nurse magazine, on September 28, 2005, Huang Jiefu, then-Deputy Minister of Health, accompanied Luo Gan, Secretary of the central Political and Legal Affairs Committee (Political and Legal Affairs Committee) and member of the CCP Central Committee, to attend the 50th anniversary celebration for the establishment of the Xinjiang Autonomous Region. There, Huang Jiefu performed a liver transplant for a local Communist Party official, at The First Affiliated Hospital of Xinjiang Medical University.1425 He first planned to conduct an allogeneic transplant, for which a donor liver had been made available. Upon inspecting the patient’s body cavity, Huang found that an autologous transplant would be suitable. Nevertheless, he procured two spare livers for his demonstration–one from the First Affiliated Hospital of Sun Yat-sen University in Guangzhou, and another from the Liver Treatment Center of Chongqing Southwest Hospital, which is affiliated with the Third Military Medical University. Within a few hours, each hospital had managed to find a donor with the “same blood type and genetic loci.” The next evening, those spare livers from both Chongqing and Guangzhou arrived in Xinjiang. Huang began the operation at 7 p.m. the next day and proceeded until the following morning at 10 a.m. After 24 hours of observation, Huang announced that the operation was successful and that the two spare livers were no longer needed. Because cold ischemia time for livers is limited to 15 hours,1426 the ‘spare livers’ could only have been two living people waiting to be harvested; more than 60 hours had passed between procurement of the livers and the completion of the autologous transplant. 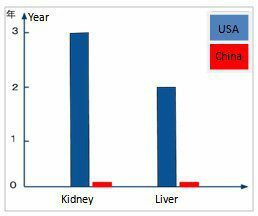 In countries with advanced healthcare capabilities and well-organized organ donation systems, patients usually wait many months or even years for a donor organ to become available.1448 Yet, in China, where organ donation is culturally taboo and there is no effective organ donation system as of yet, patients can find matching organs whenever needed, suggesting that there is a large number of readily available organ sources waiting to be matched to patients. In November 2013, an article published in the Chinese state-affiliated Phoenix Weekly highlighted the growth of organ tourism to China within the past decade, and how organs are supplied on-demand and matched quickly, with no waiting time. The article also stated that the number of transplants performed in China exceeded that in the U.S. The article has since been deleted from its original website,1449 but we have saved an archived version. This webpage is no longer accessible, though an archived version from 2008 exists. The hospital has deleted most pages under its organ transplant center and left only two expert profiles. Very little information remains. 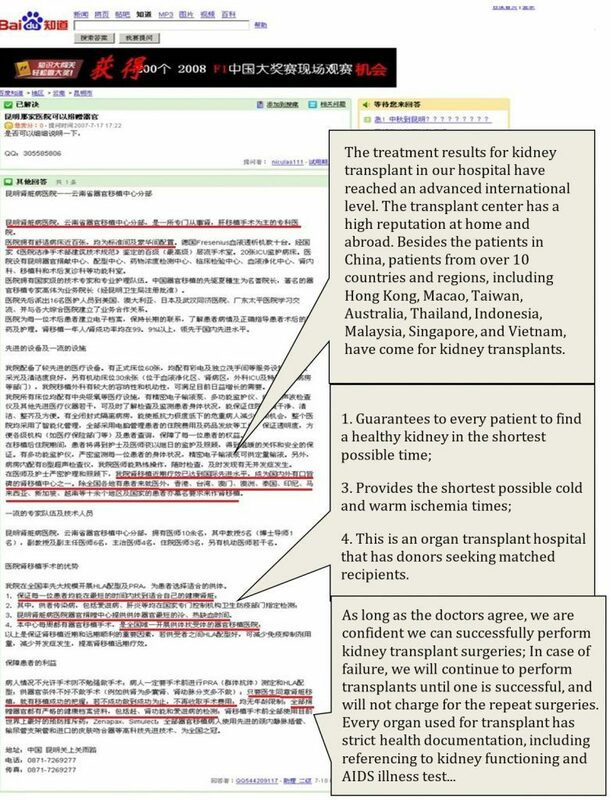 In China, it was common before March 2006 (when organ harvesting from Falun Gong practitioners was first reported internationally) that quite a few Chinese hospital websites offered to guarantee to find a living liver and kidney donor within two weeks. Some hospitals even claimed that they had ready donors available. Emergency liver transplants are performed on patients who require a transplant operation within 72 hours. Outside of China, finding donor organs for such emergency transplants is nearly impossible. According to the China Liver Transplant Registry’s 2006 Annual Report,1456 among the 8,486 liver transplants performed in 29 facilities in China, 4,331 were labeled as either emergency or elective. Emergency transplants comprised 1,150 (26.6%) of the labeled cases. In the afternoon of February 14, 2014, Jiangxi Provincial People’s Hospital consecutively performed one liver and two kidney transplants. The liver transplant patient was transferred from another hospital in a hepatic coma for an emergency transplant. The surgery began immediately after this patient was transferred to this hospital, indicating that the hospital has readily available liver sources. Hebei Daily reported that, on April 7, 2011, vice president Liu Su of the Second Hospital of Hebei Medical University led his expert group to perform a heart transplant for 13-year-old Hua Jiale.1459 The hospital found a matching child donor for the patient in a week. The report made no mention of the child “donor.” This case cannot be explained by the sourcing of organs from executed prisoners. Our survey of 165 hospitals from Chapters Two to Six showed that the vast majority of hospitals have expanded into multiple types of transplants beyond the ones for they have received permits from the Ministry of Health. Currently, the Ministry issues permits for six types of solid organ transplants (kidney, liver, heart, lung, pancreas, and small intestine); cell and tissue transplants do not require permits. The most varied example is Peking University Third Hospital, which carried out transplants of heart, lung, cornea, stem cell, bone marrow, vascular grafts, and hair, besides organ transplants approved for liver, kidney, pancreas, and small intestine transplants—eleven types in total, not including multi-organ transplants. Sun Yat-sen Hospital of Xiamen University is approved for only heart transplants, but it also performs nine other types of transplants: kidney, liver, pancreas, spleen, lung, heart-lung, small intestine, islet cell, cornea, and bone marrow. 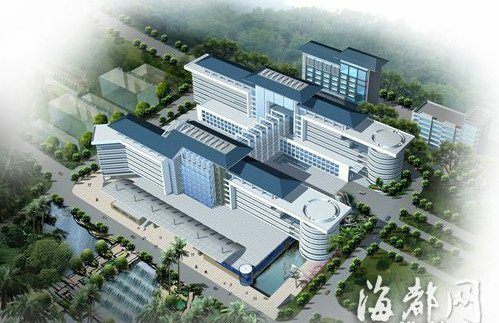 Wuxi People’s Hospital is approved for only lung transplants but also carries out eight other types–kidney, liver, heart, pancreas, cornea, stem cell, bone marrow, and vascular grafts. Below, we list the types of transplants that these hospitals have claimed to perform on their websites, in media reports, etc. These types do not include combined organ transplants. 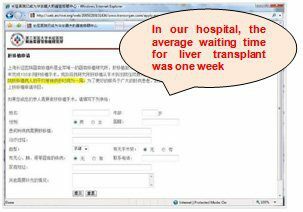 The short waiting times, quality of organs, and low fees in China attracted transplant patients from all over the world. Below are individual accounts of foreign patients who traveled to China solely to receive organ transplants. These cases all featured fast availability of organs (most within a month) upon contacting a broker, as well as short hospitalization times (1-2 weeks for kidney transplants and 2-3 weeks for liver transplants). The hospitals either did not state the sources of donor organs or, when asked, said they came from executed prisoners. The price was 6.8 million yen (about US$80,000). “It was cheap”, says Hokamura. His broker has helped more than 100 Japanese make the trip to China for transplants since 2004, and the trade is growing. If you send your personal data to this center by e-mail or fax and accept the necessary body examination in Shenyang, China in order to assure a suitable donor, it may take only one month to receive a liver transplantation, the maximum waiting time being two months. As for the kidney transplantation, it may take one week to find a suitable donor, the maximum time being one month.” The source of the organs, however, is not specified. This is a cover story of ‘Japanese Flock to China for Organ Transplants’ posted on The Asia-Pacific Journal on April 2, 2006. In January 2001, Mr. L expressed a wish to go to China for an organ transplant and had his blood drawn. About four to five days later, Mr. L received a phone call from the clinic that a matching kidney had been located in China, and that he could start to prepare for his trip. Mr. L hesitated at first and wondered how a matching organ could be found so swiftly. After discussing with his family members, he decided to go anyway. On February 1, 2001, Mr. L’s delegation of nine patients (5 male and 4 female) went together to Taiping Hospital of Dongyuan for organ transplants. After paying $130,000 HKD, Mr. L received a kidney transplant two days later, together with four other patients from southeast Asia. All 13 transplants (for the group of nine and the group of four) were finished within two days. Mr. L was hospitalized for seven days before returning home. Some patients were hospitalized for 14 days. Mr. L did not know which doctor operated on him, and no one mentioned the source of the organ. 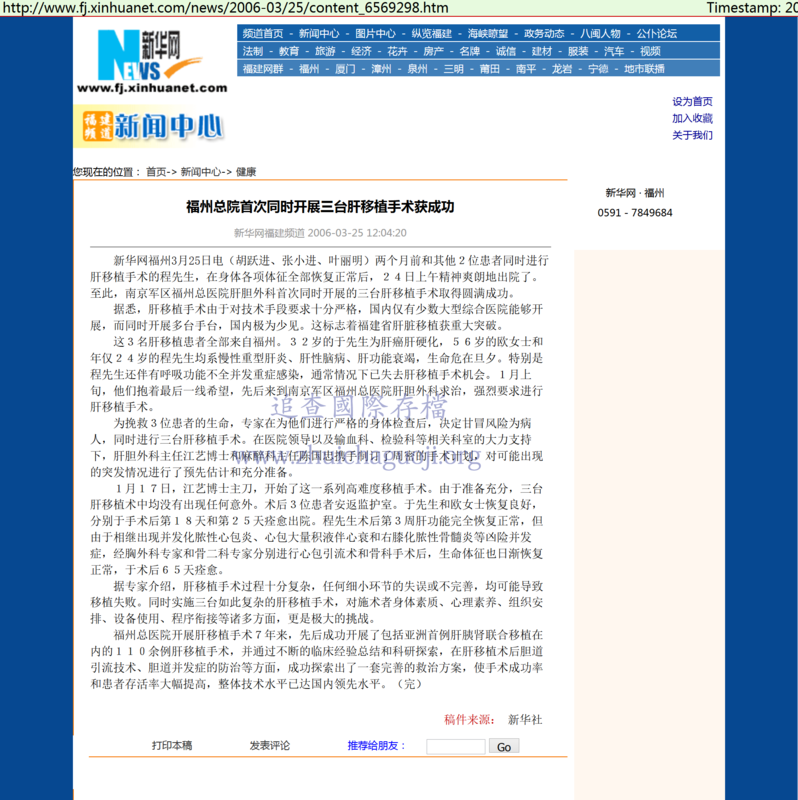 Mr. L suggested that hospitals in mainland China were participating in organ trafficking. Taiping People’s Hospital of Dongguan (in Humen District, Dongguan City, Guangdong Province) was not a military hospital. However, Wei Gao, the chief physician of the transplant department, was also a professor of and chief physician at the Zhujiang Research Institute of the First Military Medical University.1470 Some other responsible people of this transplant department were also from military hospitals. Military hospitals or doctors could easily obtain organs. Ms. Rou. Z.: blood type B, age in her forties, from Asia. Ms. Rou. Z. was diagnosed as with chronic renal insufficiency in May 2000. After undergoing kidney dialysis, Ms. Rou Z. was recommended to go to mainland China for a kidney transplant. On May 11, 2001, the broker obtained her health record and was told to stay at home to wait for further notice. Approximately two weeks later, Ms. Rou.Z. was notified that a matched organ source had been located and she could go to China for the transplant. Not psychologically prepared for a matching organ to be found so quickly, she passed on this opportunity. After two weeks, the broker called again, saying that another matching organ had been found. This time, Ms. Rou.Z agreed to travel to mainland China for the transplant, and an operation was scheduled in late June. A group of seven patients went to China together for organ transplant. Each was asked to bring $200,000 HKD. The broker received the patients at the airport on June 25, 2001 and took them on a two-hour bus ride to Humen, Dongguan City. They were admitted on the same day to the Taiping People’s Hospital in Dongyuan and given various exams. 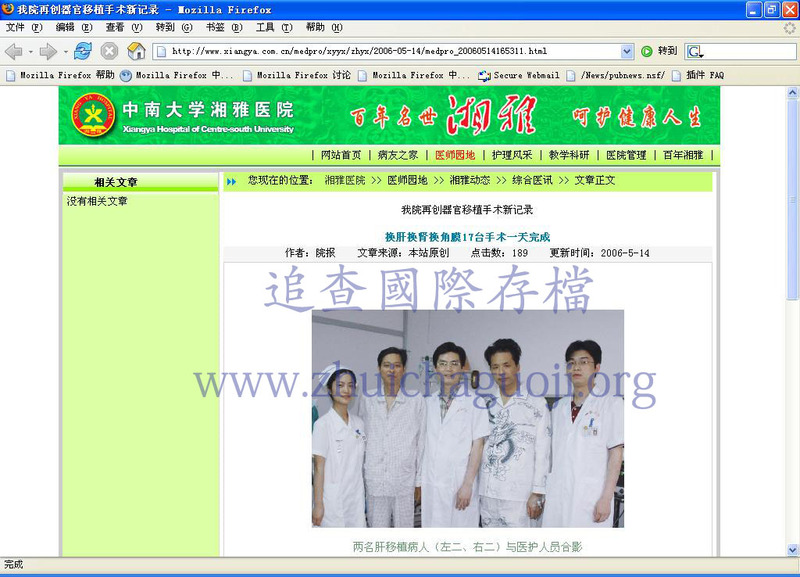 On the same day (June 25, 2001), a hospital staff member collected $140,000 to $150,000 HKD from each patient. Simplistic receipts were handed out. Patients with blood type O and those above 60 years old had to pay an extra $20,000 HKD. The entire transplant center was headed by Professor Wei Gao, but Ms. Rou.Z. did not know who her surgeon was. All seven recipients had their kidney transplants done the next day (June 26, 2001). Three operating rooms were used simultaneously. Spinal anesthesia was applied. Ms. Rou.Z. was sent into the operating room at approximately 8:00 p.m., and the operation was completed at midnight. Ms.Rou. Z. was told that she received a HLA 4 matched organ. Other patients who received a transplant on the same day included an Indonesian, a French Chinese, and a local Chinese. Surgeon Xu Jiahua had told them earlier that as long as a patient had received kidney dialysis within the hospital for five years, the patient could get a free kidney transplant. The seven patients stayed in the hospital for seven days and return home on July 3. Ms. Rou.Z. has not been told who her surgeon and organ donor were. The broker told her that the organs came from executed prisoners. Ms. R.Z. : blood type AB, age about 50, from Asia. Ms. R.Z. was diagnosed with chronic renal insufficiency in 1986. By December 2004, her situation had deteriorated, and she developed renal failure and required dialysis. In early December of 2004, she was given a suggestion to go to mainland China for a transplant and was introduced to a broker, who took Ms. R.Z.’s blood sample to mainland China on December 17, 2004. Two days later, on December 19, Ms. R.Z. was notified that a matching organ had been found that and she could travel immediately to Guangzhou for the transplant. As Ms. R.Z. had a bad cold at the time, she was only able to travel to Guangzhou with her husband and younger sister on December 24. 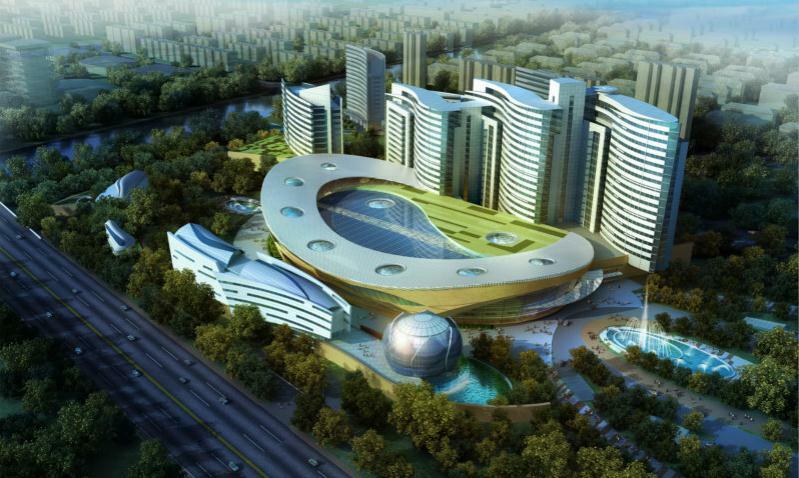 The Economic and Technical Development Hospital of Guangzhou was situated far away from the city and was very desolate. The transplant department was on the tenth floor and had 13 rooms with three beds each. Each inpatient could have their family members live in the room with them. The chief physician of the transplant department was Lin Minzhuan. There were at least ten other patients waiting for transplants or recovering from one. Ms. R.Z. saw patients from Taiwan, Malaysia, Indonesia, and other countries. The cost of the operation was $27,000 USD (including hospitalization, food and transportation). The money was paid in cash to Lin Minzhuan’s younger brother (the chief administrator) right before the operation. No receipt was issued at the time the money was paid, but under the request of Ms. R.Z.’s husband, a simple note indicating the paid amount was issued. Ms. R.Z. entered the operating room at 5:00 p.m. on December 30, 2004. The hospital staff had gone to fetch the kidney for her that morning. The operation lasted approximately four hours under spinal anesthesia. There were four other patients receiving kidney transplants on the same day. Ms. R.Z. does not know who her organ donor was. She was told by a doctor that she received a HLA 5 matched kidney. In the next five days, she was hospitalized in an isolated care unit (the unit had six beds and monitored by staff 24 hours a day, with only one staff member at night). After that, she stayed in a regular room for seven days. She returned home after the stitches were removed on January 11, 2005. Mr. J.C., in his fifties, was diagnosed with acute renal failure in January 2005. He received a hepatitis B vaccine in March and met the antibody requirements in September. He was told then that he could receive an organ transplant in mainland China. The patient received notification of an organ match on October 19, 2005. The patient attended a pre-trip seminar on October 20, 2005, where he and other patients were informed of the cost involved and told that their organs had all been matched, so there was no need to worry. The group of eight patients arrived at the Guangdong Province Border Patrol Armed Police Central Hospital in Shenzhen on October 26 at 4:10 p.m. Professor Wei Gao gave a pre-surgery seminar that evening. The surgery fee of $150,000 HKD in cash was collected from each patient. Some patients asked how the condemned criminals were executed. Dr. Gao said they were not shot; rather, they were given two injections (one for anesthetic and one painkiller) before the organs were taken. The patient paid $2,700 HKD for accommodation, $12,800 HKD for medicine, and 700 HKD for haemodialysis. The entire operation cost in mainland China was $169,019 HKD. According to the interviewee, the transplant hospitals in Mainland China do not issue receipts of payment for medical treatment; the hospital gives proof of medical treatment only when deemed absolutely necessary. They would provide the proof of the last two dialyses done before surgery, so that patients could apply for the public health insurance reimbursement after returning to Taiwan. All expenditures were paid in cash with Hong Kong Dollars through the handyman. The total cost for the patient was about $29,000 USD, including “red envelope” money, airline ticket, etc. Mr. J.C. stayed in China for only 3 days. Mr. J.C. entered the operating room at about 4:00 p.m. on October 28. The kidneys for transplant arrived at the hospital at about 2:10 p.m. the same day. The location where the organs were obtained must not have been far from the hospital. The nurses, riding in an ambulance and carrying cooler boxes, came back with eight kidneys. Mr. J.C. was out of the operating room at about 8:30 p.m. Afterwards, the eight transplant patients were hospitalized in the Supervision Unit, where family members were not allowed to enter. The patient was discharged on November 4. The doctors in the hospital were all military doctors. The medical certificate was given in the name of the Auxing Group Junhui Company (translated by sound of name), and the type of hospitalization was registered as self-paid locals. The patient said that the group before them was from Indonesia. One day after they left, a group from Singapore would come to the hospital for organ transplants. 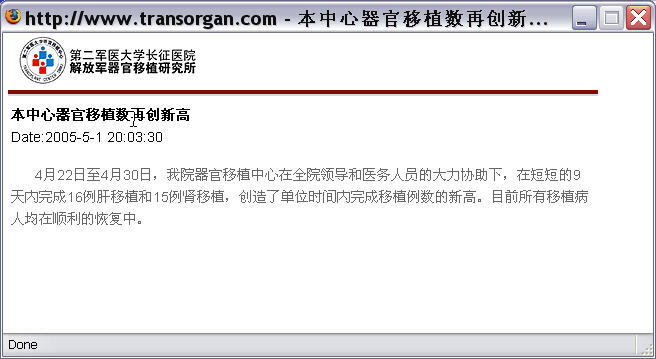 Note: This transplant was done at Guangdong Province Border Patrol Armed Police Central Hospital. It was said only military hospitals or doctors working at the army hospitals could easily obtain organs. Ms. T, in her fifties, from Asia, was diagnosed with chronic renal insufficiency in 2000 and started dialysis in July 2003. She got in touch with a local organ broker in November 2005. She had a pre-transplant evaluation and immunological evaluation at a local hospital and sent the results to the broker in early December. The broker asked Ms. T to prepare $26,000 USD in cash and told her that it usually took one week to find a matching organ. The broker also said it was preferred that the patient go to mainland China to wait for a matched organ. However, Ms. T expressed that she would like to wait for a matched organ to be located before leaving for mainland China. Ms. T was informed on January 4, 2006 that an organ source had been found and that her flight ticket was ready. On January 6, 2006, the broker took Ms. T and another organ transplant patient and flew to Wuhan in Hubei Province. Ms. T was hospitalized at 2 p.m. on the same day at the Land Force General Hospital of Wuhan and received a blood test immediately. She was sent to an operating room at 5 p.m. and received spinal anesthesia. She was sent out of the operating room at about 8 p.m. The doctor in charge of her case was Tang Ligong. There were three rooms for transplant patients, and each room had three patients; there were nine beds in total. She was told by a doctor that she received a HLA 3 matched organ. She was discharged on January 19, 2006 and returned to Taiwan. The Land Force General Hospital is a military hospital. The broker told Ms. T that the organ came from an executed prisoner (the same explanation generally given by hospitals in mainland China). It was said that military hospitals could easily obtain organs. No families were allowed to visit the transplant patients at this hospital. This report illustrates that a living “donor” was killed when his/her liver was excised at the same time as the recipient’s bad liver was removed. It also indicates that transplants are performed in every corner of China, no matter how remote. 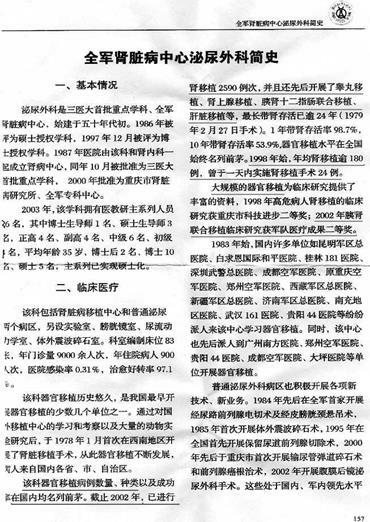 In October 2015, Huang Jiefu told Beijing Youth Daily that China had only 169 hospitals with permits to perform one or more types of transplants. He expressed a desire to increase the number of qualified transplant hospitals from 169 to 300 and train 400 to 500 young doctors.1477 A more recent Xinhua report published in China Daily on May 15, 2016 stated that, according to Huang Jiefu, “China will increase the number of hospitals conducting organ transplants to 300 in the next five years.”1478 This suggests that the current system-wide capacity far from meets demand. Evidently, the availability of organs is not the main limitation. 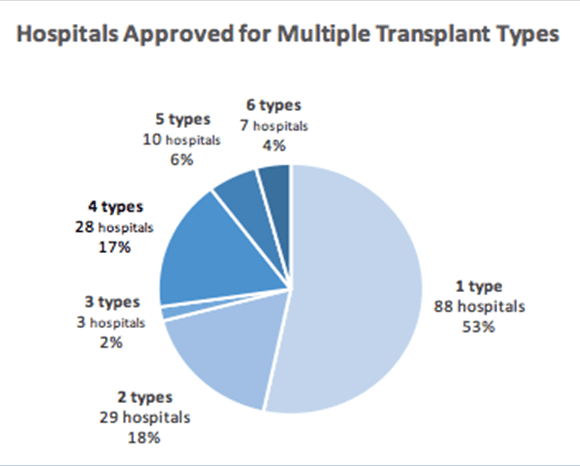 The continued expansion of existing transplant centers and plans to qualify so many new ones suggest that the number of transplant operations is constrained by medical facilities and personnel. We found a number of hospitals with bed utilization rates between 100% and 200%. The Hepatobiliary Surgery Department at Guizhou Provincial People’s Hospital focuses development on liver transplantation as its key discipline. It can routinely carry out liver, pancreas, and other types of large-organ transplants. Despite the increased capacity of transplant centers, there is still a growing stream of patients waiting for transplants in the transplant hospitals, as one can see from the following examples. The high demand drives high bed utilization rates and number of transplants performed. To meet the ever-increasing demand for transplants, most hospitals we analyzed have expanded their transplant wards and even constructed new buildings, often including VIP-style amenities to cater to transplant recipients from other countries. Reading through the individual hospitals for the first time, we felt as if we were observing a monstrous flywheel. “There are too many, too many patients! We have surgeries here overnight, nonstop for 24 hours a day,” Dr. Cheng Zheying told a Wenhui Daily reporter in March 2016.1501 Chen also said that the surgery building is the main battlefield for Renji Hospital’s surgeries. As many as 120 surgeries are performed here in a day. The most difficult and advanced surgeries, including robotic surgeries, are all performed here. Each operation lasts over four hours, so even with the over ten operating rooms all open, doctors have to operate until late at night. This does not include liver transplants, as liver sources coming from other areas are often brought back to the hospital late at night, so it is quite common to conduct surgeries until early morning. “The operating room is like a secret garden in the hospital. We have no time to be in contact with the outside world. The lights are on 24 hours a day here. Seven or eight o’clock at night is the same as in the morning. One can’t tell day from night,” Chen Zheying said. Because of the long-term continuous operations, many of the medical personnel have developed lumbar diseases, cervical spondylosis, and varicose veins. The Liver Transplant Center has experienced phenomenal growth. It increased its bed count from the original 13 at the end of September 2004 to 23 beds less than 10 days later. It later increased to 90 beds in June 20071505 and 110 beds in 2014.1506 Its utilization rate and transplant volume also continued to hit new highs. The new surgery building at Wuhan Union Hospital was under construction between August 8, 2002 and September 2006. It has 32 stories above ground and 2 underground. The integrated surgery ward building has 1,050 beds and 42 operating rooms. 1518 It can accommodate 200 surgeries per day, a volume equivalent to those of five medium and large-scale hospitals. 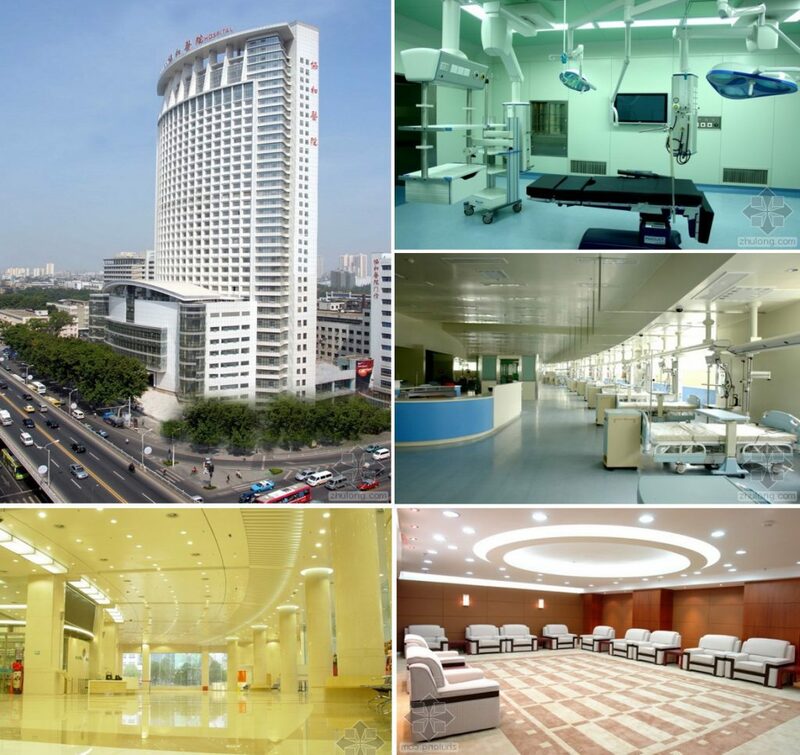 1519 It is the largest-scale surgery building in Asia, and its advanced facilities are second-to-none in Asia. 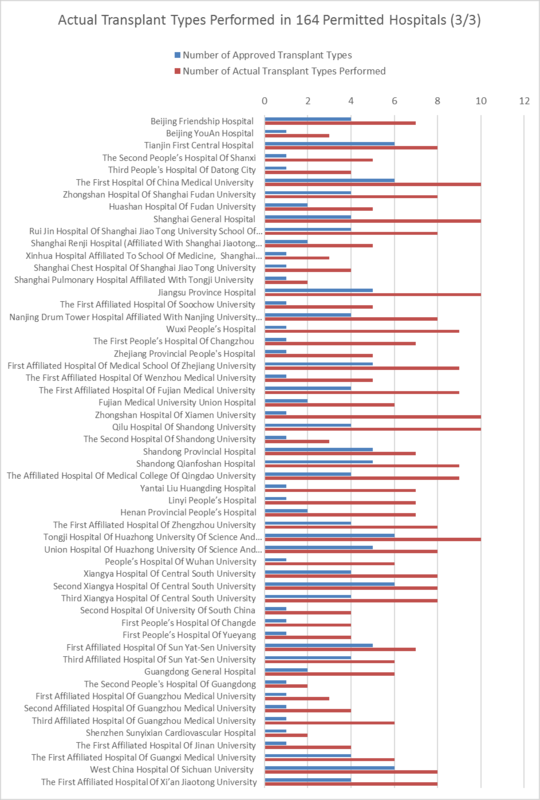 Fujian Medical University Union Hospital leads the nation in the number of allogeneic heart transplants performed. Its pediatric heart transplantation and heart re-transplantation fill a gap in this field in China. Its technology in liver transplants, heart re-transplants, and bilateral lung transplants lead the nation. Since its cardiac surgery department conducted the first orthotopic heart transplant in Fujian Province in 1995, it has successfully performed heart transplants for patients with advanced heart disease from more than 30 cities and regions of China. The department ranks among the best in allogeneic heart transplant, holds 16 “first in the country” titles, and serves as the base for heart transplantation in China. 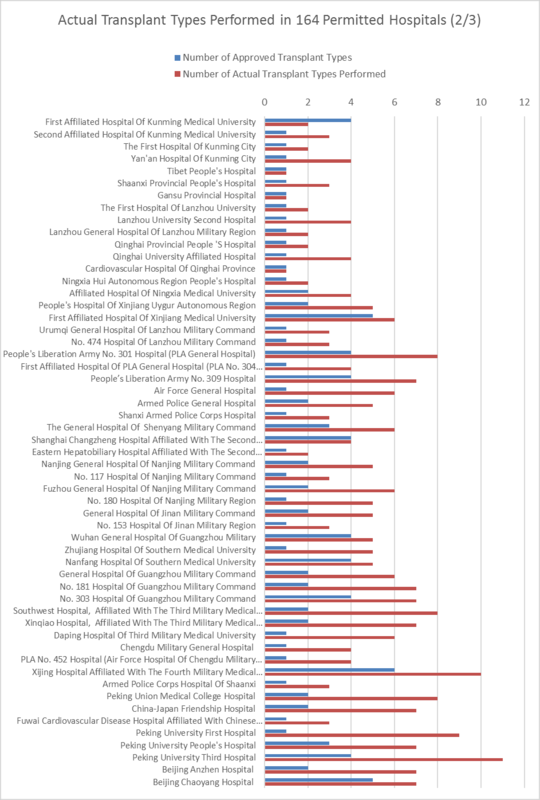 In 2009, the Shanghai Municipal Government collaborated with the People’s Liberation Army General Logistics Department to develop the Second Military Medical University. 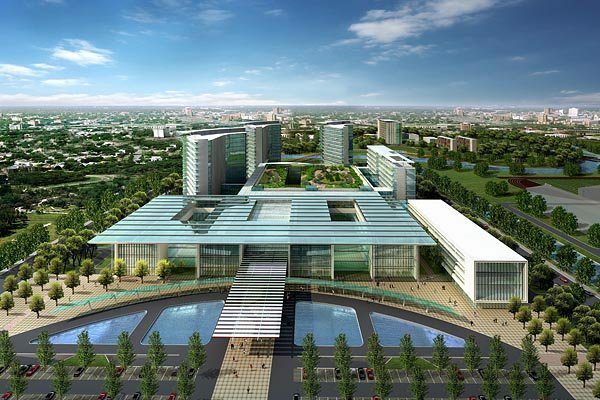 Its development strategy was to move its affiliated Changzheng Hospital eastward to the Pudong District, and to move its affiliated Eastern Hepatobiliary Hospital westward to Jiading. On October 18, 2015, the Eastern Hepatobiliary Hospital, located in Anting in Jiading District, Shanghai, started operations.1560 The hospital covers a construction area of 200,000 square meters and contains 1,500 beds. We observed that a number of medical teams and individual doctors struggled to carry out the volume of transplants demanded of them. The scale can be seen in surgeons working overtime to procure organs and conduct transplants, as well as departments carrying out multiple transplants simultaneously. One hospital even resorted to training almost all of its general surgeons to conduct organ transplants. “During transplants, because of special aspects of the donor organs, we often need to do heart, liver, and kidney transplants simultaneously. This increased our workload more than ten-fold. Every person is overloaded with work every day and put in multiple times the effort.” She included one example: “In October 2005, we performed heart, liver, and kidney transplants in one day. This was a major test for us.” The team first carried out the heart transplant, followed by kidney and then liver. By the end of 2014, Shen Zhongyang, Director of Tianjin First Central Hospital’s Oriental Organ Transplant Center, had performed close to 10,000 liver transplants.1569 This hospital is the largest organ transplant center in Asia. According to the hospital’s website, it has 10 surgical departments and more than 100 surgeons. How many transplants is the hospital performing to necessitate training almost all of its surgeons in the procedure? In addition, the hospital has a breast transplant department with more than 40 beds, 3 chief physicians, 2 associate chief physicians, 4 attending physicians, and 3 residents.1576 These doctors’ web pages are no longer accessible. After the 2006 publicity surrounding live organ harvesting, the Party/Government indicated that transplant numbers had gradually decreased. Yet, that was not the case. There has been continued expansion of transplant hospitals after 2006. The Government blamed the chaotic market for live organ harvesting. To “recertify and regulate” the market, the Ministry of Health started to issue permits to transplant centers, and hospitals without permits would no longer be allowed to continue conducting organ transplants after July 1, 2007. 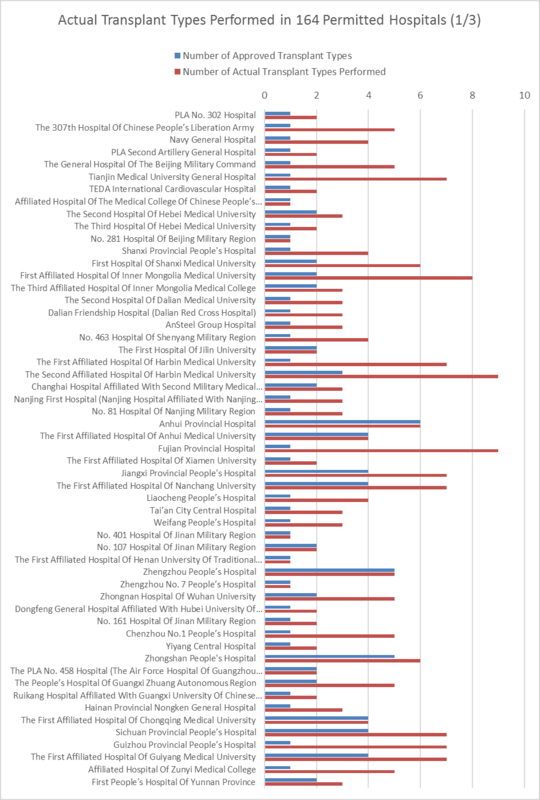 In July 2007, more than 1,000 transplant hospitals in China applied for permits under this new system, including nominally unrelated hospitals of traditional Chinese medicine or occupational diseases.1577 Only 164 received permits. This meant that the Government could monopolize and redistribute the organ market. As a result, large transplant centers faced less competition and achieved even greater development than before. We observed that some institutions that did not receive permits either reduced their transplant volumes, stopped performing transplants, or operated under increased secrecy. Nevertheless, many that did not have permits but were able to obtain organs continued to operate. By January 2014, the approval list had been expanded to 169 hospitals.1579 Among the five newly added centers is the First Hospital of Foshan, which was limited to liver and kidney transplants from donors with no cardiac activity. Based on its website archived on November 1, 2012, before being approved,1580 it had launched not only kidney, liver, heart, lung, kidney-liver, and pancreas-kidney transplants but also living-donor liver transplants. The hospital’s website has not published its transplant numbers after the publication of the Matas/Kilgour Report in 2006. However, its addition to the list of approved hospitals in 2013 indicates that it continued its transplant operations after 2011. Similar situations occurred with the other four newly added transplant centers. We further found that at least 75 non-approved hospitals were issued permits for pilot runs of transplants from DCD starting in 2011 and continued to perform transplants. Party-controlled media claimed that organ transplants had been drawn down or stopped, that there were not as many organs available, and that transplant hospitals could hardly sustain themselves. The transplant hospitals also removed or tampered with related websites and information regarding the number of transplants performed, and either falsified or stopped updating their reported data. Contrary to the message from the Government, we observed that the scale of organ transplantation in mainland China in general has not been declining; rather, it has entered a period of stable development. The Chinese Government issued statements that the scale of organ transplantation has decreased since 2006. 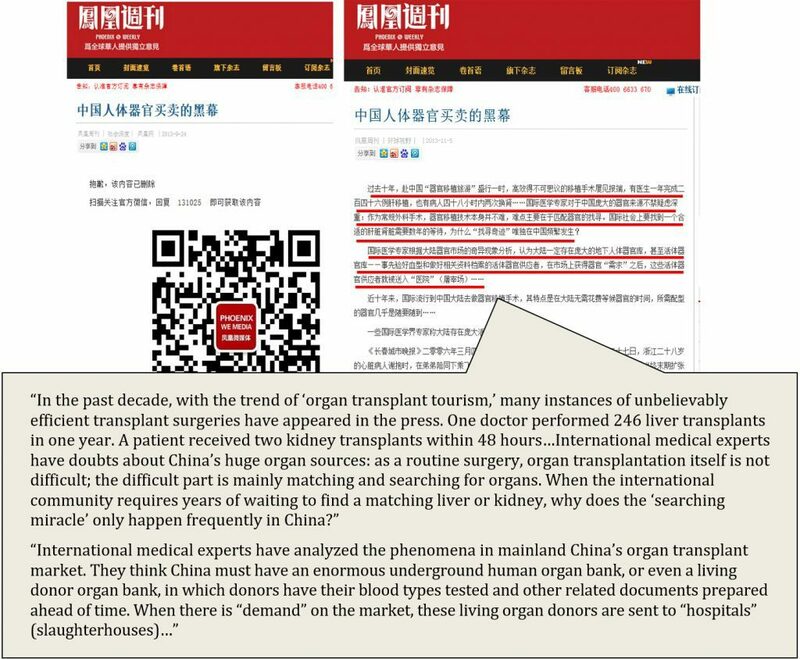 For example, on December 18, 2007, Southern Weekend published an article entitled “China calls for a halt to ‘organ transplant tourism.’”1584 The article stated that the largest organ transplant center in Asia, Tianjin Oriental Organ Transplant Center, saw a sudden drop in the number of transplants performed since 2007 due to a lack of donor availability. The article also stated that in the first half of the year, the center had only 15 liver transplants, all of which were from patients’ relatives. By 2013, the hospital’s overall bed utilization rate had increased to 131%.1587 Based on developmental needs, the hospital added 300 beds and adjusted the number allocated for several departments, including the organ transplant center. Sina Health May 11, 2011 Reporter: Song Ruliang, etc. 1391 “100th Anniversary of First Affiliated Hospital of Sun Yat-sen University.” XKB.com. October 9, 2010. Xiangya Hospital of Centre-south University. June 3, 2005. Xiangya Hospital of Centre-south University. September 3, 2005. Xiangya Hospital of Centre-south University. May 14, 2006. Development of Transplantation.” The Third Xiangya Hospital of Central South University News. Issue 9, May 2006. Original link is no longer accessible. Please refer its archive. David Matas, Esq. and Hon. David Kilgour, Esq. , 31 January 2007. Source: Sanxiang City News. Sina. November 10, 2012. 1496 Liu, Yongxiao. “The Journey of a Healthy Liver.” People.cn. January 20, 2011. Third Edition. 1497 “The Road of Organ Transplantation in China.” Dooland.com. Source: Oriental Outlook. September 27, 2013. 1498 “Thousands of People Waiting for Kidney Transplants; Only 17 Donors This Year.” Jindongqu.cn. October 14, 2014. 1533 “Triple Happiness’ at Union Hospital Cardiac Surgery Department.” Fujian Medical University Union Hospital. 1534 “Union Hospital Affiliated with Fujian Medical University Integrated Surgery Building.” Archcy.com. September 25, 2012. Fujian Medical University Union Hospital. 1570 “Shen Zhongyang: Hope of Transplants, Strengthening Life.” Source: Guangming Daily. January 27, 2011. 13th Edition. The following archive was captured on 2014-01-07. Chinese Journal of Integrated Traditional and Western Medicine in Intensive and Critical Care. February 2006.